1. Pour raspberries and sugar into a sauce pan and let it simmer for about 20 minutes to reduce. Just let it simmer while you do everything else, but check it often to make sure it doesn’t burn or cook too fast. Low heat. 3. Crush the cookies finely either in a bag and smash them, or use a food processor, then mix in the butter. 4. Line mini cupcake tin with papers. 5. Put a small amount of the cookie mixture (about 1/3 of the cup) into each paper cup. I used the flat end of a wine cork (just the right size) to tamp down the cookie mixture. 6. 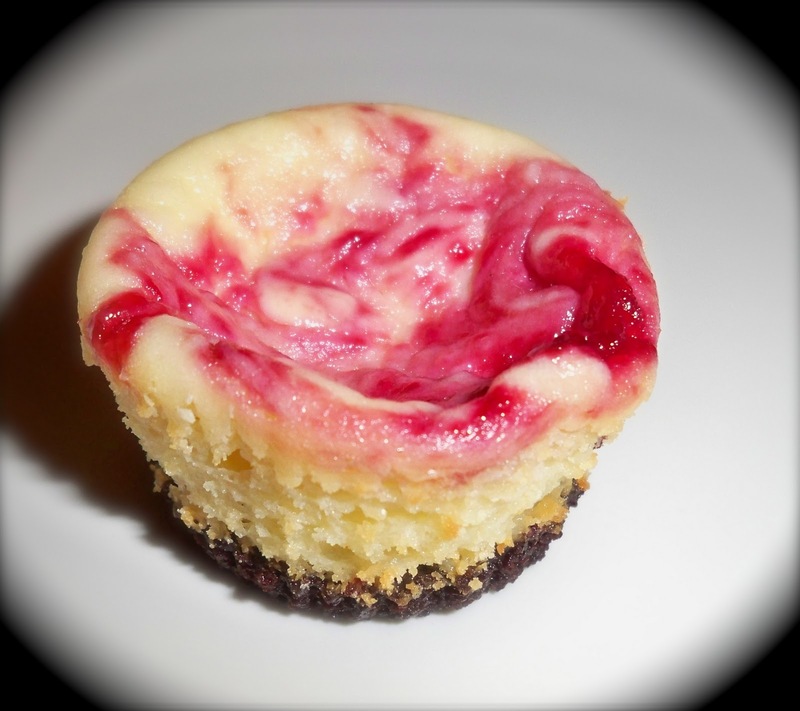 Using a mixer, blend the cheesecake ingredients until smooth. 7. Fill the cups to just about full. 9. 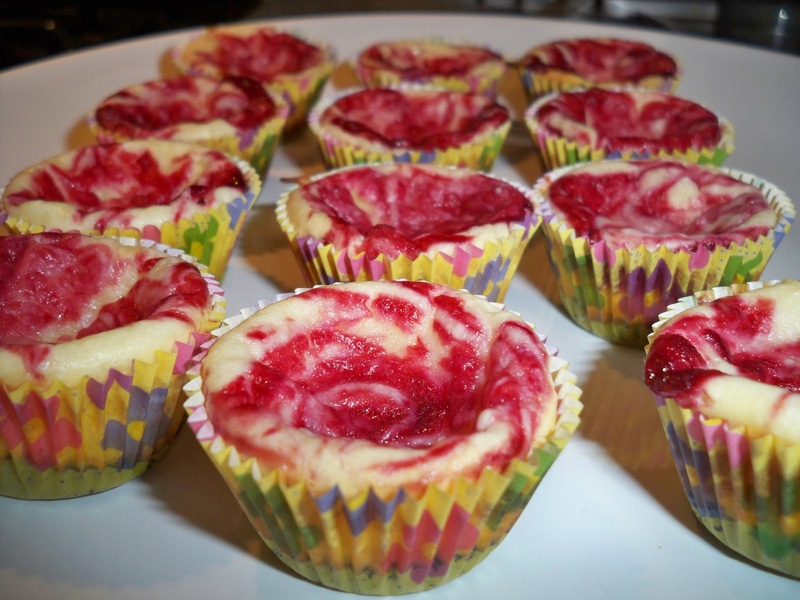 Dot each cheesecake with the syrup, then swirl with a toothpick to make a pretty design. 10. Bake in the oven for 15 minutes. They will puff up when they cook, then sink back down when you take them out. Don’t worry, that’s normal. Let them cool for about 10 minutes, then refrigerate until you need them. Of course, I was in a hurry and put them in the freezer for 20 minutes, then in the fridge for a few hours at the party. Take them out about 20 minutes before you want to eat them so they aren’t too cold. Yum! These are tasty bites of heaven and everyone raved at the party. The most tedious part of the process is tapping down all the cookie crusts and swirling the raspberry sauce. I recommend getting an eager teen to help you, it certainly makes it much quicker and much more fun. This recipe made about 65 of these little beauties, and they were all eaten in less than 30 minutes.